SwarmFarm Robotics field operations lead Tom Holcombe sees optical weed-seeking microwave units on a robotic platform as the next big thing in non-chemical weed control. IF a herbicide resistant weed never sets seed then it won’t be long before the resistance is eradicated. This is easy to say, but has been mighty hard to achieve because it is so time consuming. Enter now the power of robotic weed control. Frequent scouting for, and removal of small weeds, is now a practical reality with a commercial robotic platform available for broadacre cropping operations. 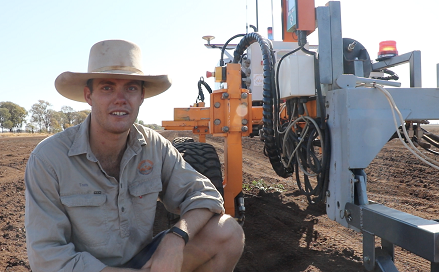 SwarmFarm Robotics field operations lead Tom Holcombe says the theory has been proven recently in trials in Central Queensland, where weed blow-outs in fallows on two sites were brought under control using repetitive herbicide applications. The two sites were on separate properties in the Springsure district of Central Queensland. 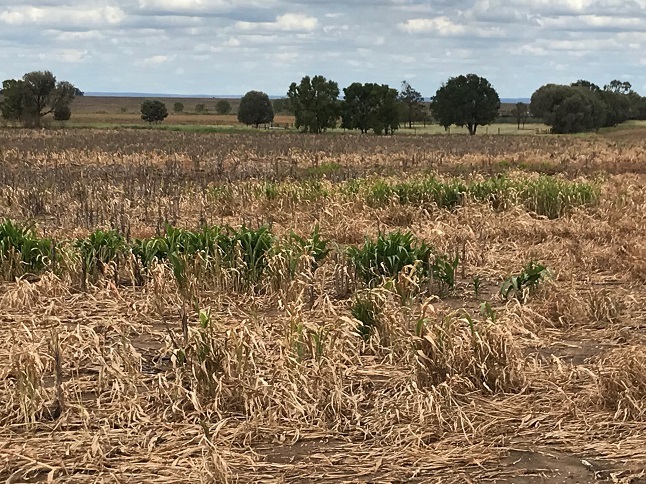 One site was 44 hectares of fallow at ‘Kilmore’, following dryland sorghum, with weeds managed from August 2017 to March 2018. The other was 28ha at ‘Denlo Park’, following dryland cotton, with weeds managed from October 2017 to March 2018. “To control weeds present in high numbers at both sites we decided that the robots would spray on a fortnightly basis to regain control,” Mr Holcombe said. Over a period of eight weeks of routine, fortnightly spraying with knockdown herbicides using a Weedit mounted on the robot, the weed density dropped from the initial 20 per cent of the area, when it was considered out of control, down to approximately 2pc of the trial area. This use pattern would be considered impractical and inadvisable in a conventional herbicide spraying program. The robotic platform made it possible, and it was effective due to the continual knocking of the same weeds until death was achieved and seed set prevented. A commercial robotic platform also brings the opportunity to use optical weed sensing technology in conjunction with non-herbicide weed control tactics such as chipping and microwaving. Both SwarmFarm (with Queensland state government funding) and The University of Western Australia (with GRDC funding) have shown that optical sensing works well with a chipping tyne implement that is activated only when a weed is ‘spotted’. This makes cultivation for weed control site-specific and is compatible with zero-till farming. Another prototype that SwarmFarm developed within the Queensland government’s Strategic Cropping Land Mitigation funded project was a small microwave unit that activates only when a weed is present (as detected using a Weedit sensor). “There has been a lot of interest in the potential of microwave for weed control, but the power and time involved has kept this technology out of reach,” Mr Holcombe said. “Having several small units teamed with the Weedit sensors and mounted on a robotic platform opens up a whole new set of opportunities. 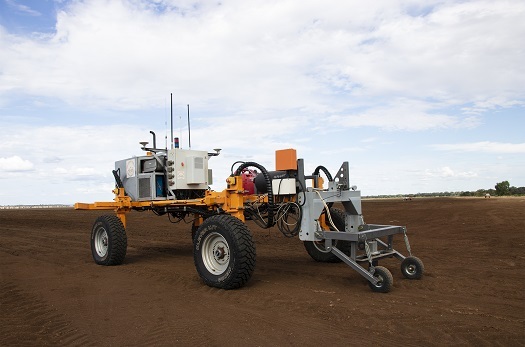 Having several small microwave units teamed with the Weedit sensors and mounted on a robotic platform removes the time and power constraints that have so far prevented microwave weed control being a realistic option for broadacre operations. The power constraint is also more realistic than trying to apply a ‘blanket’ microwave treatment across a whole paddock. Since only a few units on a multi-unit bar are likely to be activated at any one time, the power draw is far less and small weeds are much easier to kill than large weeds. “There is also a soil health benefit given that the weeds can be controlled without affecting the soil biota of the whole paddock,” he said.